In this intensive 1D/2D modelling course, you will learn to build, run, interpret, troubleshoot and animate flood models from the very start. This course is run in association with Surface Water Solutions. 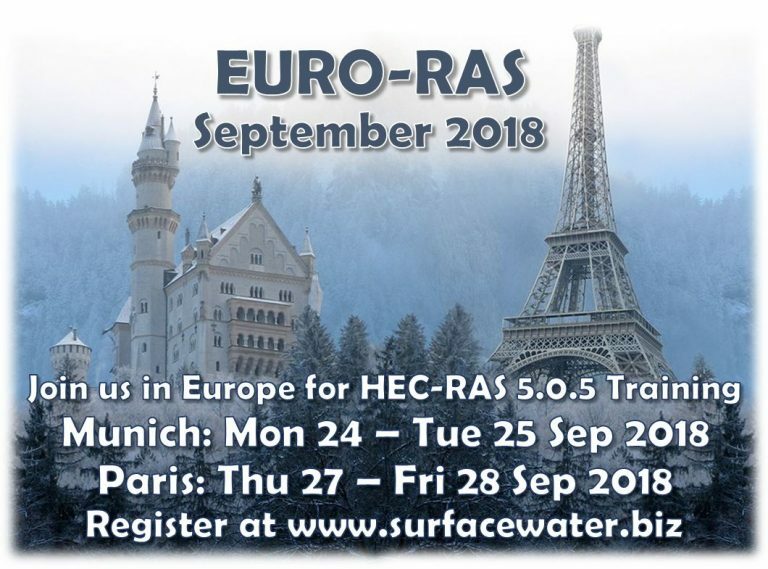 Registrations are now open for the first HEC-RAS course in Paris which will be held Thursday 27 September and Friday 28 September at G2C Ingénierie, located at 128 rue de Charenton. Learn to build, run, interpret, troubleshoot, and animate flood models from scratch in this intensive, interactive training course. The course includes all new European case studies for the HEC-RAS 1D/2D modelling course, including direct rainfall/rain on grid, and urban and coastal flooding, hydraulic structures, GIS interfacing, and terrain manipulation within HEC-RAS. About HEC-RAS. Presentations will be taught in English to accommodate international attendees; each day’s course runs from 9:00 to 17:00.